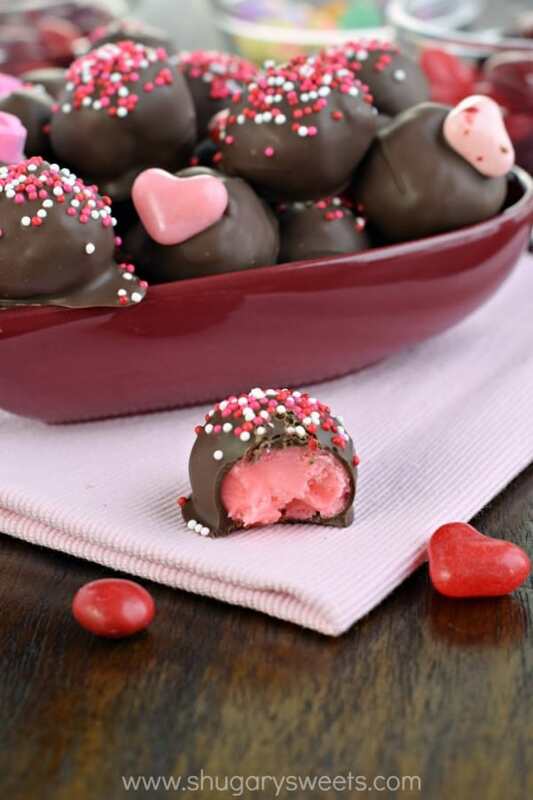 Chocolate Covered Cherry Truffles for your love! You can whip them in an afternoon for the sweetest Valentine’s Day yet. When my husband and I met (23 years ago, eeps!!) he informed me of his love of chocolate covered cherries. Now, there are very few things that I do NOT like, and those Queen Anne chocolate covered cherries are on the list. But, like a good wife, I buy a box for my husband every single Christmas. And every single New Years I throw them in the trash. Because as it turns out, he doesn’t like them. And I forget this piece of information every year, that his taste buds have changed and he no longer enjoys that holiday treat. But, you know what we DO have in common? Our love of homemade truffles. 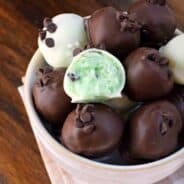 As it turns out, we BOTH enjoyed this Chocolate Covered Cherry Truffles recipe! I even made a quick little video for you, to see just how easy they are to make! Use a good quality white chocolate chip for this recipe. The cheap ones, and the generic ones do not melt smooth! I find Ghirardelli to work wonderfully every single time! Heat your heavy cream in saucepan on low heat. Add your butter until melted, add your cherry gelatin powder and stir until smooth. Add the white chocolate chips and mix quickly until they are completely melted. Refrigerate the white chocolate mixture for about an hour. Once chilled, it should be soft (but not hard). Use a 1 Tbsp scoop to drop truffles onto a parchment paper lined baking sheet. FREEZE truffles for about 30 minutes. Use finger tips to shape frozen truffles into a ball. Then use a toothpick to dip truffle into melted chocolate. Again, USE GOOD CHOCOLATE. I love the bags of Ghirardelli Melting Wafers. Not only do they melt smooth, but they taste delicious too. Be sure to add your sprinkles or candy immediately, before the chocolate hardens. 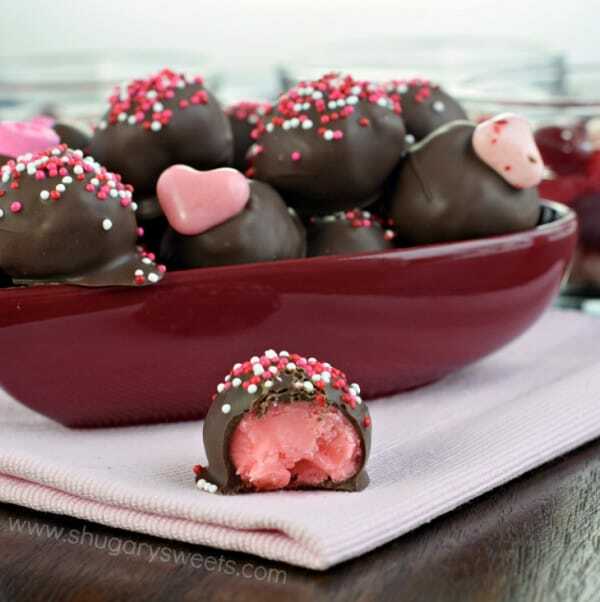 Check out some of my other favorite truffle and candy recipes for the Valentine’s Day! 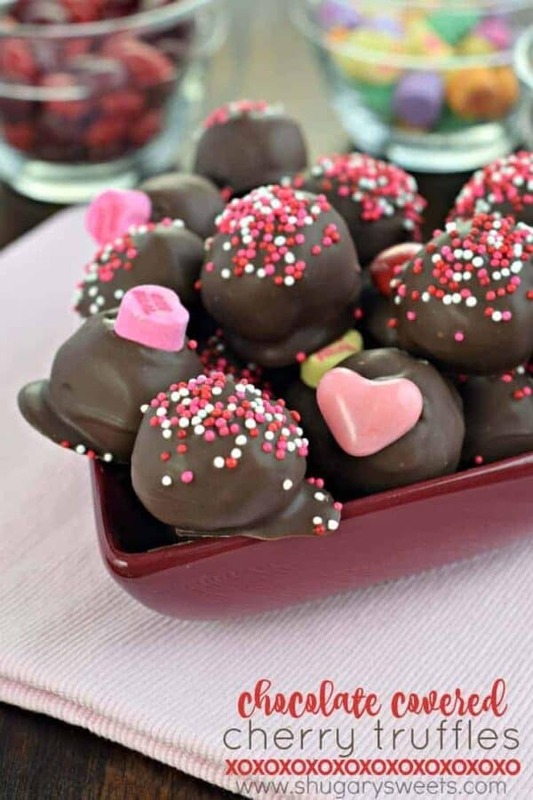 Be sure to stop over at Food Fanatic for this delicious Chocolate Covered Cherry Truffles recipe! Yep, I’ve never gotten down with the super-red cherries in those chocolate-covered candies. But these truffles I can do, and then some! They look so incredible!! EEEEK!! These are the cutest! Almost too cute to devour, but then again my inner food love gets the best of me most times 😉 These look DELISH! Confession…I do like those boxed chocolate covered cherries! You knew we eventually had to find some things we don’t agree on, right? But these homemade candies look amazing too! I love that you used Jello to flavor the white chocolate!!! Too fun! These truffles look about a thousand times better than those boxed chocolate covered cherries! Love that pretty pink color! That is too funny that were you still buying them for him! I’d happily take a box of these truffles! Such a cute Valentine’s Day treat! I think your solution to the chocolate cherry waste issue in your household is genius! Isn’t it funny how we like something at one point of our lives and then it doesn’t stack up? I think food quality has changes a lot over time even within proven candy brands; not surprising those cherries aren’t tasting so good. AND I can’t imagine anything better than these! Ohh, I can’t wait to try these! I love the combo of chocolate and cherries together, but I always feel store bought stuff falls short. Pinned! Have to admit that I love the chocolate covered cherries- but, will only eat one brand- Cella with clear liquid. web site. 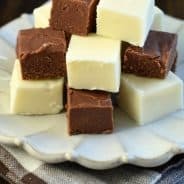 Love your truffle and fudge recipes. Will try this one right away! Thanks for sharing! Looks scrumptious! Did you have to temper the chocolate? I am not big on cherry flavored anything (but love real cherries) but I don’t mind raspberry, blueberry, you can mix any flavor jello into these. Bet orange would be pretty tasty. They are so elegant! The options are endless. Chocolate strawberry truffles WOW! I cannot eat chocolate on count of a disease I have. I would do white chocolate,milk and dark chocolate covered. I would also color the white in colors for Easter. You got my brain running! Thank you for this share so much! I love it! help! After mixing these up and leaving them in the fridge for over an hour, the mixture isn’t “scoopable”. (The scoop doesn’t hold its shape at all, not even a little. For now, I will leave the bowl in the fridge overnight. This is my first attempt at truffles so what went wrong and what can I do to ‘thicken’ this up?? (Maybe I’m panicking too early?) Thank you in advance! It would definitely change the taste (still good I imagine), but should work just fine! Do you think you could chop up candied cherries really small and mix some into this? Would it change the texture do you think? Want to mae today….can I use diet jello/no sugar jello? Thank you for posting! I always have trouble with candy – but this looks easy to make! Thank you for sharing! These look really good and so pretty, but could you also make them strawberry? Do I need to keep them refrigerated after making? These turned out great for a party I had this weekend. I also made them with orange jello and white coating. Also great. QUESTION – why did the coating crack on some of the candies after sitting for a little while? How can you prevent that? Should you refrigerate them after dipping or not? Thanks! Thanks Aimee. I’ll try that next time. Hello! Did you try this recipe again by chance?? I can’t get mine to harden up at all. Pingback: 61 Easy Truffle Recipes - Joy Pea Health | Food. Drink. Happiness. Wellness. I’m in process of making these and maybe I did something wrong, but came here for the comments in case someone else is experiencing the same thing – it appears they did. After being in the freezer for 30 minutes the cherry filling is sticking to the waxed paper. It rolls into a ball fine, but halfway through dipping, the rest on the pan are too soft to continue to dip so I’m sticking them back in the freezer. I made the mistake of melting the expensive ghiradelli dark chocolate at once, so i’m Hoping it will remelt ok once I go back to dipping. 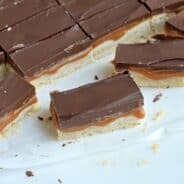 I notice the author of this blog is responding only to the positive comments and not the “hey, this isn’t working for me.” So if you came here looking for some help, my advice is to dip half a batch at a time so you don’t waste chocolate, and be patient if you lose half the cherry filling because it sticks to the pan. Lastly, keep these refrigerated because as the filling warms up, it will ooze out of the chocolate. If anyone has any advice for not getting the cherry filling to stick, that’d be great! Using waxed paper (and not parchment paper) could be the issue people are having with it sticking. They should be easy to remove off of parchment paper. I usually do half a batch dipping while the other half stays in the freezer.